Many of our visitors come to Warcombe for a fishing holiday. We are one of only a few North Devon camping parks to offer a private coarse fishing lake to our campers. We established a coarse fishing lake at Warcombe in 1998 which offers great sport for all the family. The lake is well stocked with Carp, Tench, Roach and Rudd as well as Perch. The water occupies around an acre of land and provides a haven for wildlife. Even if you are not a fisherman you can enjoy the beautiful vista, watching the amazing water birds that can be seen around the water. Heron, ducks, Snipe and Kingfishers are spotted regularly. We have some lovely lakeside pitches with their own gate access to the water where you can rest, picnic or get out your rods and cast out! The park has a general fishing licence so you only need to purchase a day ticket from reception in order to fish the water from dawn to dusk. Rod hire is available and we encourage children to learn under the supervision of a competent adult. Some of the fish are very large – carp are 15 – 20 lbs in weight. We love posting pictures of your catches on our website. We hire out fishing rods so you don’t even have to worry about transporting equipment! Our shop sells tackle spares and a variety of bait. In the local area there are of course plenty of opportunities to go sea fishing. Many fishermen can be seen on the beaches and pier. Ilfracombe is only 5 miles away and there are lots of organised fishing trips available from the harbour. Trips can be a couple of hours or all day, and may be booked in advance. The opportunities for a Devon fishing holiday at Warcombe Farm are many and varied. 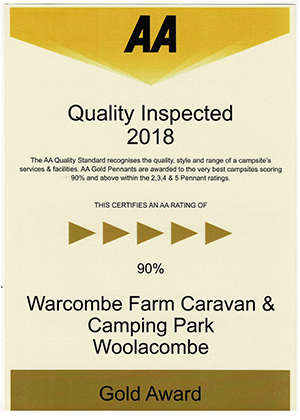 Warcombe Farm Camping and Caravan Park has its own coarse fishing lake, open only to guests. It is well-stocked with Carp, Tench, Rudd and Roach. We have our own General Fishing Licence, which covers usage by our guests – a personal fishing licence is not required, you only need to buy a day ticket from us. If you do not have your own fishing rod, we have equipment available for hire from our own site shop. Whether you are a keen enthusiast, or an absolute beginner, why not have a go? For the welfare of the fish, beginners must be supervised. We can offer serviced Fisherman’s Pitches – situated next to the lake, with private direct access to the water. Sea fishing … the coastline is never very far away, deep sea fishing trips can be found in Ilfracombe throughout the season, we would be pleased to advise. The use of the fishing lake is exclusively for our guests. A general rod licence is held which covers the site – therefore you only need to buy a ticket from reception to fish the water. We also have fishing tackle available if you wish to hire it.